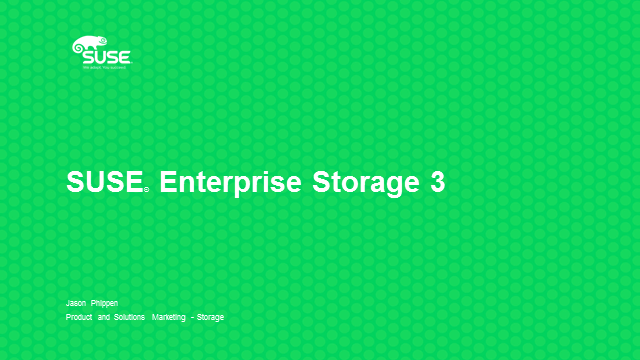 The latest intelligent software-defined storage management solution from SUSE® is the first commercially supported solution based on the Jewel release of the Ceph open source project, ensuring customers are first to get supported and easy access to the rapidly advancing Ceph community innovation. •POSIX compliant Ceph filesystem (CephFS) adds native filesystem access, so customers now have unified block, object and file access in their SUSE Enterprise Storage cluster. •Multisite object replication provides asynchronous active/active multi-cluster environment to ensure replication at distance for improved disaster recovery, along with truly long-distance replication for block using asynchronous block (RDB) mirroring. •A new framework to simplify management by providing the foundation for an advanced graphical user interface management tool (using openATTIC), as well as orchestration of the cluster using Salt.